We are pleased to announce the fourth in our series of catalogues offering historical artifacts and research materials centered on Colorado and the American West. If you would like to receive the next catalogue, please email or call. Let us know that we are reaching out to interested people. Images presented in this catalogue are not necessarily to scale. In most instances, actual dimensions are given in the item description. All items are guaranteed to be authentic and as described. If purchaser believes this not to be the case for a specific acquisition, purchaser must notify us within 24 hours of receipt and, upon our acknowledgement, return this item to us within 3 days. For us to consider returning the purchaser's full payment, the item in question must be returned in the same condition and state in which it was received. All items in this catalogue are subject to prior sale. Unless prior arrangements are made, items must be paid for in advance of being mailed to purchaser. Institutions are offered a 30-day net payment cycle or, with prior arrangements, billed to meet their specific budgeting requirements. Payment can be made via check, U.S. Postal Money Order, wire transfer and/or Paypal. A 4% surcharge will be added to Paypal payments. Mailing costs are the responsibility of the purchaser and will be added to the purchase price. Unless otherwise arranged, all items are mailed via priority USPS Mail with full insurance. Orders over $1,000.00 are mailed via first class USPS Registered Mail with full insurance. Please do not hesitate to ask us for references. 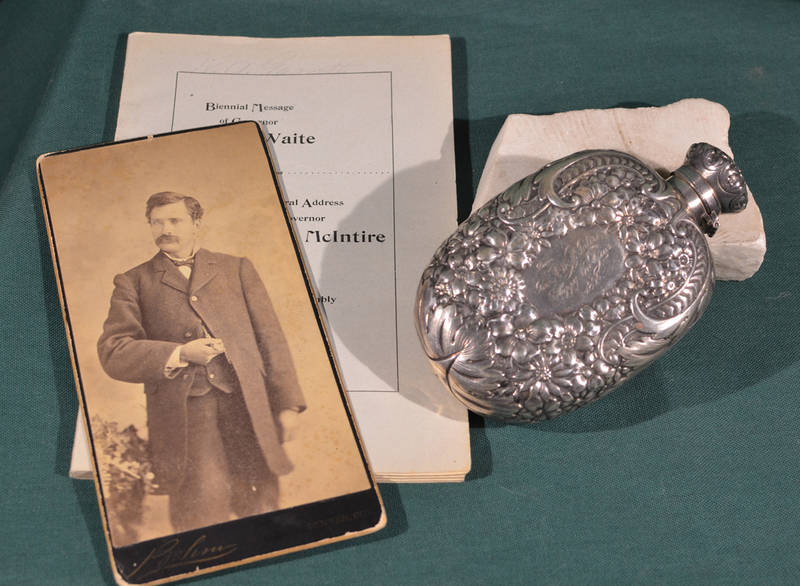 This lot includes three items, all related to Governor McIntire: 1) a silver-plated whiskey flask with English hallmarks on its base; engraved into face, "From Gov. A. W. McIntyre, Happy New Year, 1896"; 2) Biennial Message of Governor Davis H. Waite and Inaurgural Address of Governor Albert W. McIntire; and, 3) original portrait of Frank Webber of Golden, Colorado, recipient of the silver-plated flask from Governor McIntire; photograph by either Mr. or Mrs. Charles Bohm, Denver. Photograph dimensions: 4 inches by 8-1/4 inches. 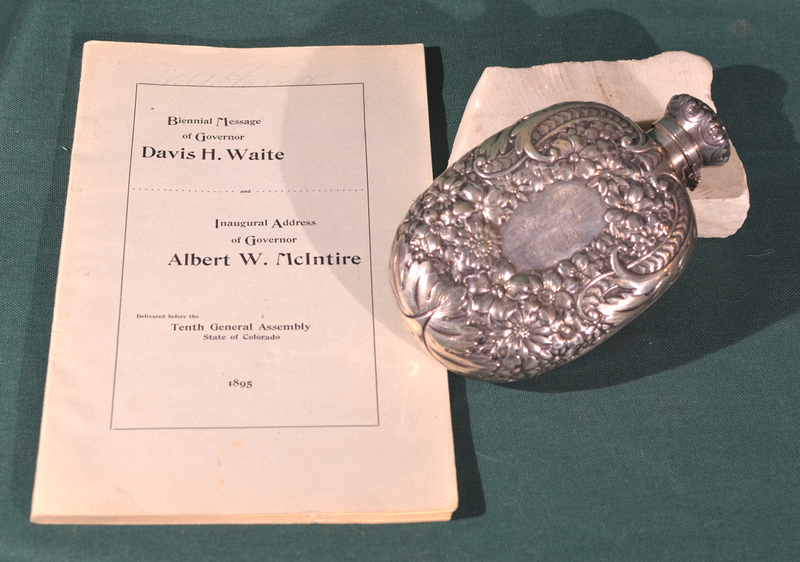 To-date, this presentation flask appears to be the only extant example of its kind given out by Governor McIntire. 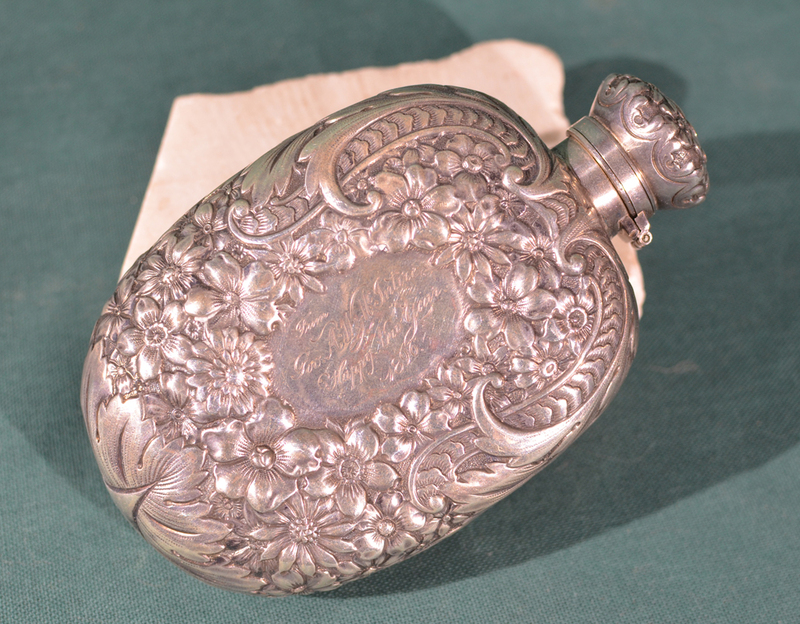 The flask design is of a Victorian style, common for the period; however, the fact that a Colorado Governor was handing out such flasks speaks to the prevalence and acceptability of the "liquor-politics" of the time and/or of the close relationship between Albert McIntire and Frank Webber. Publication: Biennial Message of Governor Davis H. Waite and Inaurgural Address of Governor Albert W. McIntire. Original printed covers; 99 pages. Denver, Colorado: The Smith-Brooks Printing Co., State Printers, 1895. Near fine condition. Governor Albert W. McIntire served from 1895 – 1896; graduated from Yale in 1875 with a law degree. He moved to Denver, Colorado in 1876. In 1880, McIntire moved to Colorado’s San Luis Valley, acquiring a ranch near La Jara. Governor McIntire, a Republican, had his inauguration at the Tabor Grand Opera House and reception at the Brown Palace Hotel in Denver. McIntire was the first Colorado governor to be voted on via universal suffrage. He strived to bolster women’s government services; restricted gambling establishments; and improved the State Insane Asylum in Pueblo. McIntire was also in favor of State oversight of banks and the upgrading of Colorado’s road system. 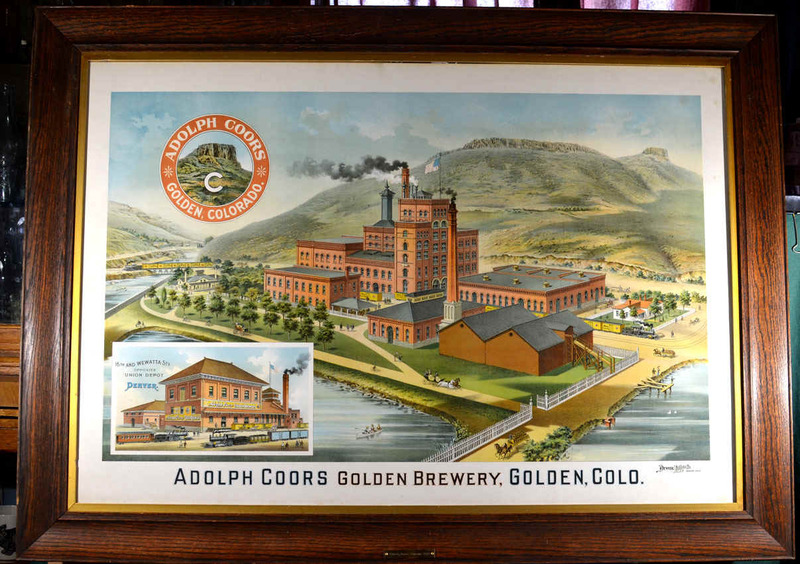 In 1889-1890, a silver rush began in the Creede Mining District of Colorado. Its mining camps grew at an incredible rate. After the discovery of the Last Chance Mine, the number of buildings in the narrow Willow Creek Canon expanded so rapidly further “subdivisions” had to be platted. 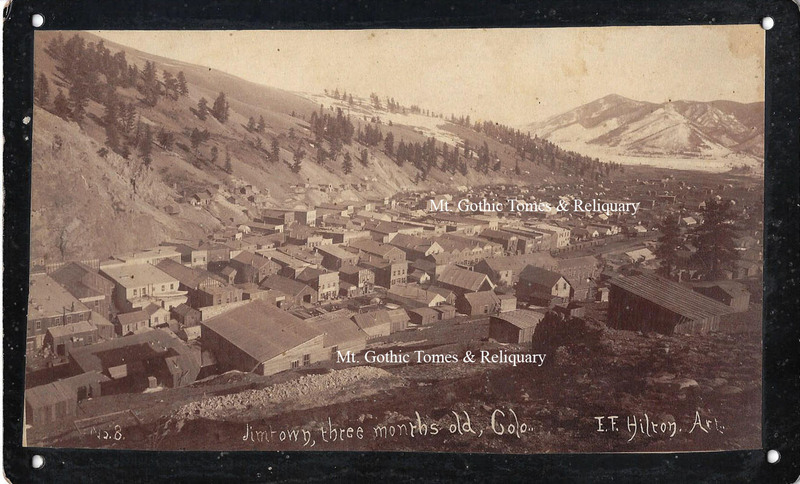 Jimtown (actually known as “gin town”) was one of these overflow settlements, established down valley from the original Creede mining camp. E. F. Hilton, a photographer with an Alamosa studio, recognized opportunity, and in 1892 established the Castle Rock Gallery in Creede. The original cabinet card image offered here was taken shortly before a fire that destroyed the new mining camp. Photograph (7-3/4 inches by 4-1/2 inches) No. 8 mounted on original Castle Rock Gallery card. A small hole punched in card at each corner; light water-staining on back (does not negatively impact photographic image). 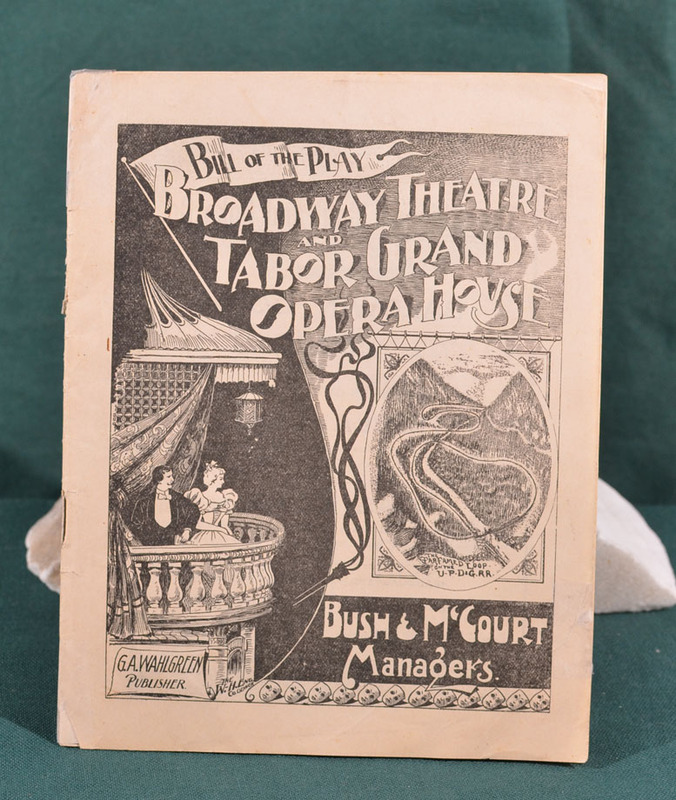 Original pamphlet compiled and published by The Excelsior Printing and Publishing Company, 205 East Sixth Street, Leadville, Colorado, 1895. Printed tan wrappers; 49 pages; photographic illustrations. First edition: 2,700 copies printed. Pamphlet dimensions: 8-3/4 inches by 6 inches. The professions of the women included in this interesting publications range from dressmaker to physician, boardinghouse owner to musical instructress, elocution and physical culture intructor to ice-rink owner. Pamphlet condition: very good plus; some light wear to covers; spine strong; pages clean and bright. No author listed. No listings in OCLC. Wynar 1130; however, different publisher (possibly later printing in Wynar). 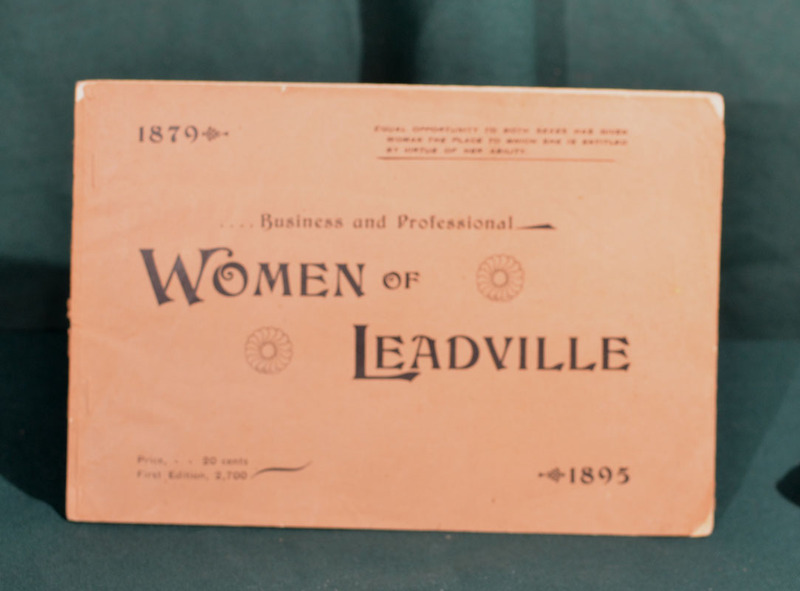 L. A. Vinton & Co., Real Estate and Mining Investments, Leadville and Lake. 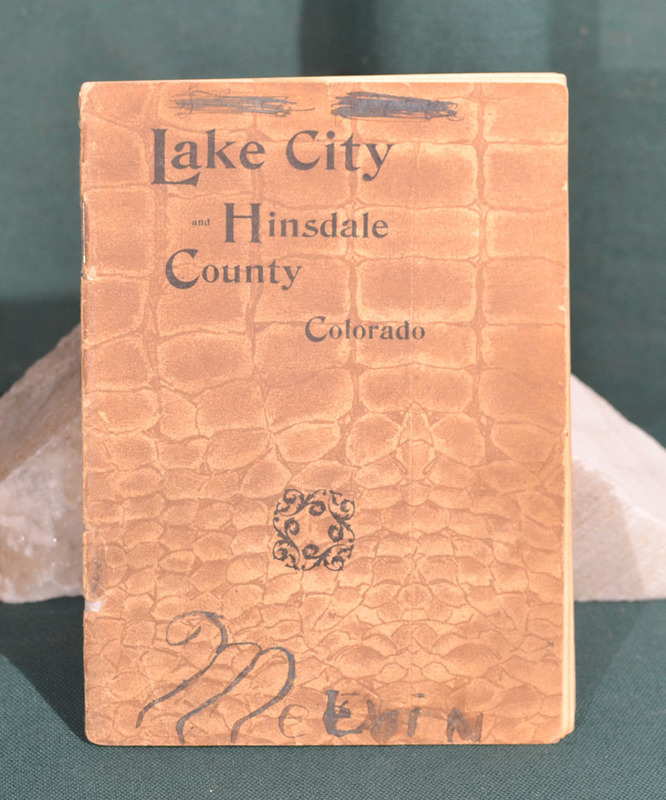 Advertising “Mining properties in the Gold Camps of Leadville, Lake City, Camp Creek, Cochetopa, Nugget City, etc.” This pamphlet (was) issued for the purpose of advancing and perpetuating the mining industry of Hinsdale County … It is respectfully dedicated to thoughtful and intelligent readers wherever they may be found. Original printed tan wrappers (pseudo-snake skin appearance); 38 pages. Very good condition. Illustrated with photographs. Local advertisements. Previous owner’s signature on front, title page and inside back cover. Details on Galena Mining District and Lake Mining District: mountains, mines and camps. Publication dimensions: 4-1/2 inches by 6 inches. One copy located in OCLC: Wynar 3580. Prospectus: The properties of the Company, as shown on the map hereunto attached, consisted of fifteen lode mining claims, embracing an area of seventy-five acres about two miles upon the Alpine Vein; all located on Alps Mountain in the Cascade Mining District, Clear Creek County, Colorado, near Idaho Springs. Original illustrated red covers; 48 pages; illustrated with photographs. Two foldout plates: 1) sectional drawing of present and proposed underground development; and, 2) map showing claims of the Consolidated Alpine Company. Near fine condition. Publication dimensions: 6-3/4 inches and 10-1/4 inches. Highly detailed. Printed on coated paper. No listings on OCLC or in Wynar. 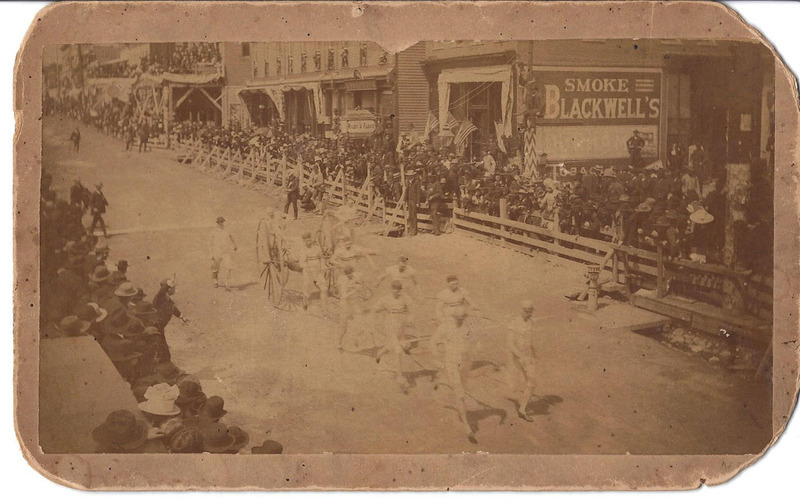 Cabinet card photograph: Firemen’s race, Leadville, Lake County, Colorado, circa 1885. Location of event: 100 E. 3rd Street, outside the establishment of Riley & Flood (H. P. Riley and T. B. Flood). Corners worn on original mount. No photographer listed. Albumen image lightly chipped on upper edge. Tones and contrasts: very good plus; a very light shade of sunning. Image dimensions: 7-3/8 inches by 4-1/4 inches. Overall condition: very good. First edition published, 1905. 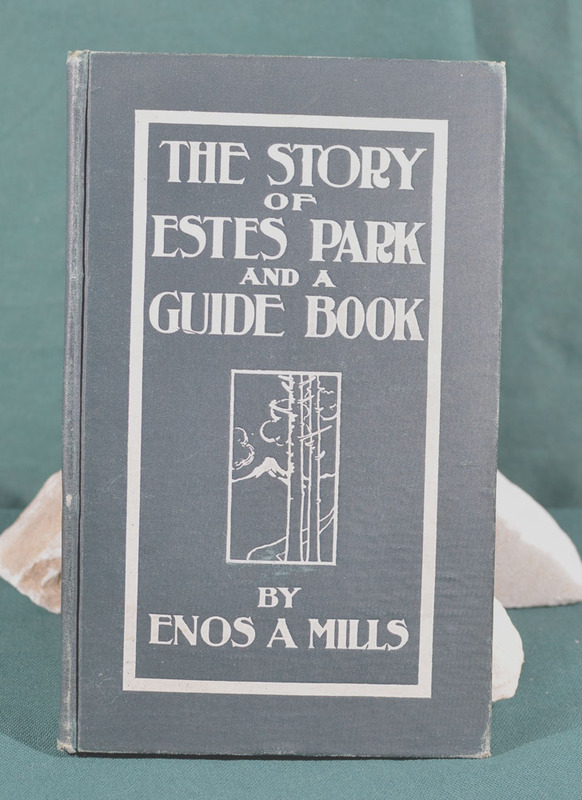 Published by Enos Mills. 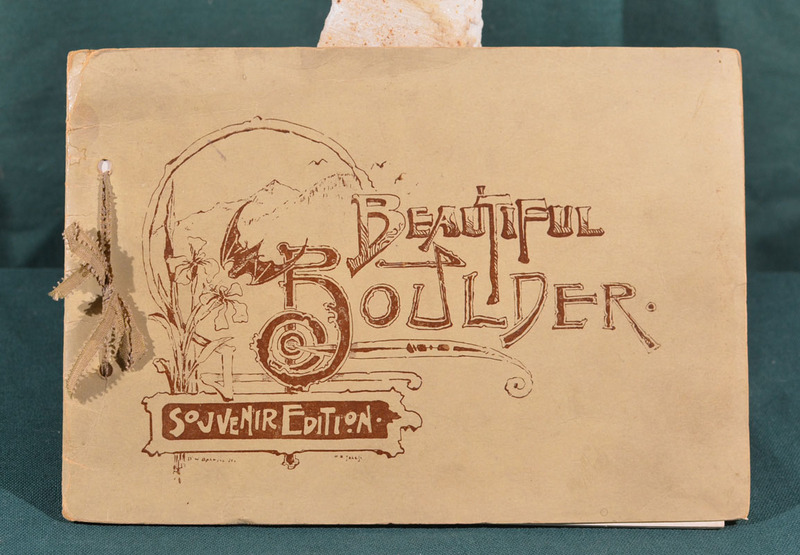 Printed by The Outdoor Life Publishing Co., Denver, Colo. 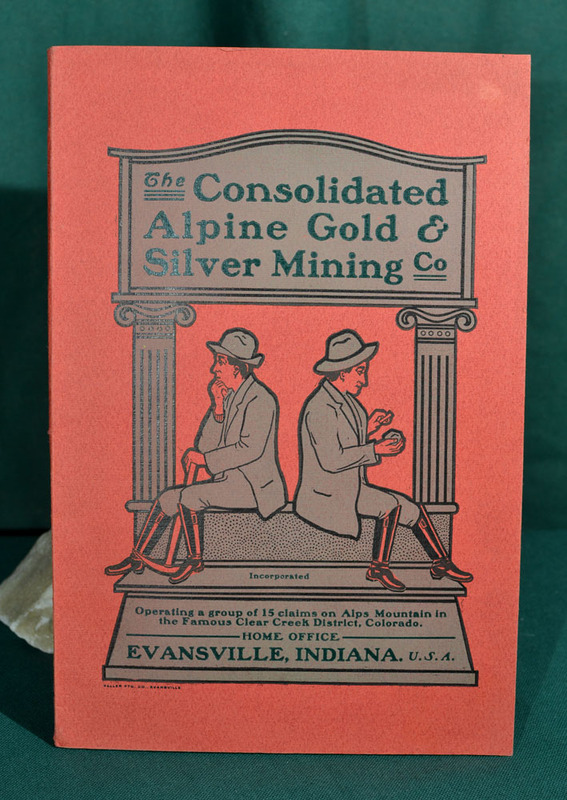 Original white-printed, illustrated green-cloth covers; 105 pages, plus index and 6 pages of advertisements. Enamel-coated paper; numerous illustrations. 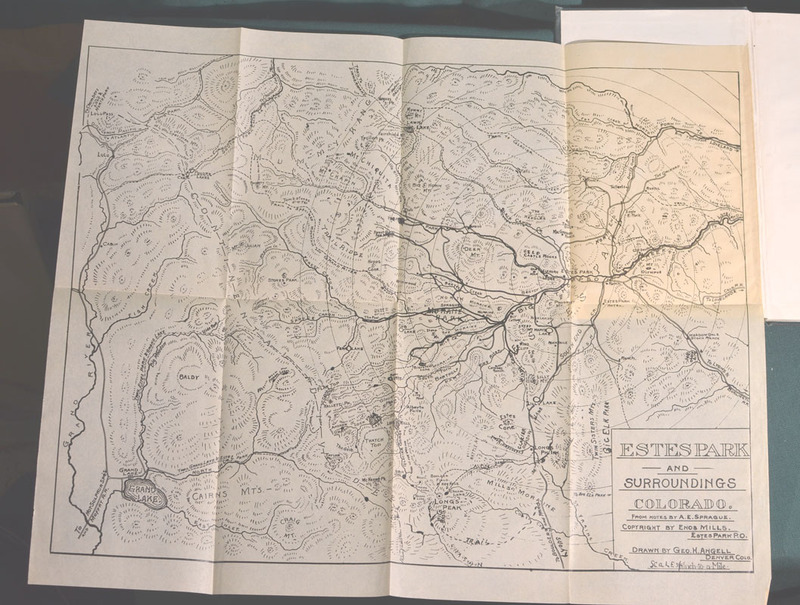 Fold-out Map: 17-1/2 inches by 14-1/2 inches; Estes Park and Surroundings, Colorado from Notes by A. E. Sprague; copyright by Enos Mills, Estes Park, Colo.; map drawn by Geo. H. Angell, Denver, Colo. Scale: ¾ inch to a mile. Book and map very good condition; clean, bright pages; Page 51 has some damage and a small missing triangular section of paper from lower margin, but no loss of information. No listings in OCLC. Wynar 8694. Compiled from Photo-Half-Tone Engravings made by D. B. Yale. Original illustrated wrappers; string-tied binding; 28 pages. D. B. Yale, Photo-Engraver; Publisher, Camera Press. 14 pages of photographs; 14 pages of descriptive. Enamel-coated pages. Very good plus condition. Publication dimensions: 9 inches by 6-1/4 inches. Buildings and scenery. No OCLC listings. Wynar 713. Bill of Play for the Week Commencing January 30, 1898. (William) Bush & (Peter) McCourt (Baby Doe’s brother), managers. Denver, Colorado. G. A. Wahlgreen, Publisher. Original illustrated covers; 24 pages; local advertisements. Program for Boston Lyric Stock Company’s presentation of “Maritana,” a standard opera in four acts by Vincent Wallace, Broadway Theatre. Tabor Grand: “Shall We Forgive Her” with Marie Wainwright. Very good plus condition. Dimensions: 6 inches by 7-1/2 inches. “Orchard Homes in Sunny Colorado. Opening of The Carey Act Lands in La Plata County under the Canals of The Colorado Land & Water Supply Company, in the former Southern Ute Indian Reservation.” The American Colonist & Trust Company, Denver, Colorado. Prospectus for land purchase. Original printed light wrappers; 64 pages; photographic illustrations. 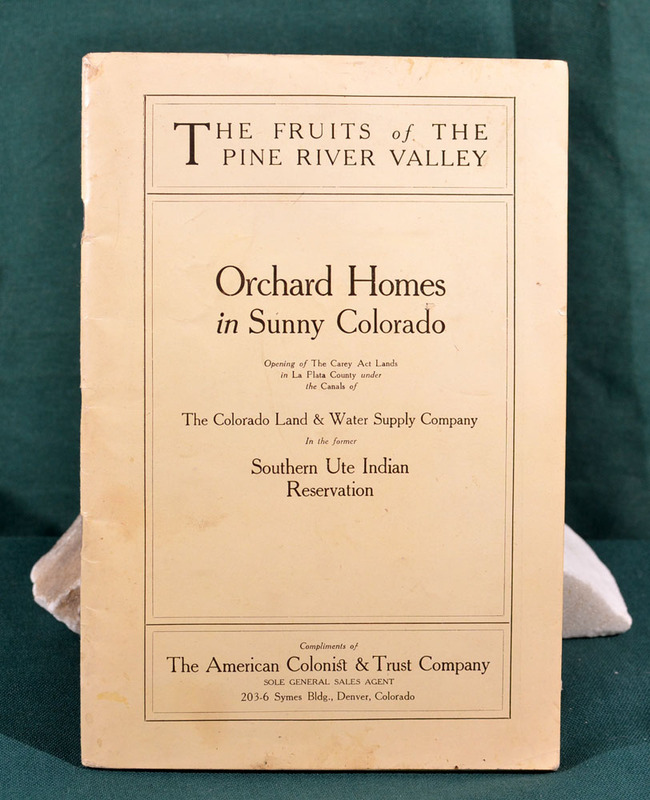 Descriptive concerning Southwestern Colorado; Great Valley of the San Juan; Story of Pine River Valley; Irrigation; Water-Rights; Costs; Climate; Soil; Present-Day Conditions; Apple Growing in Colorado; Great Pear Country, etc. Very good plus condition.